Hey there! It's Sunday so that means I get to share the latest challenge at Sentimental Sundays. Our theme is Easter/Spring. I am going with Spring because I have made so many Easter cards already. I used a sentiment/image from the Flowers in Bloom. I printed it on craft cardstock and then colored in with my Copics. Added a little Stickles for sparkle and then punched in the circle form. The pattern papers are Bo Bunny, the fabulous white tape I received in a tag, the orange dot ribbon is Michael's. I used my tiny attacher to staple it to the card front. Love little bitty things. Very nice. Love the colors you used! So lovely Amy! Love the staples and the space you left on the top. beautiful card, it looks great. These vibrant colors made me smile the moment I looked at this card. CAS and I love the combo of kraft, blue and that lovely shade of yellow. Gorgeous card! This is such a lovely combination of colors. I love the clean design. Beautiful card Amy - thanks for joining in with us at Daring Cardmakers. Such a happy looking card!! Just Fabulous! LOVE it! Yay Amy I received your beautiful card what a lovely gift. He takes pride of place on my shelf beside me so I can look at him forever. You can also see him if you pop on over to my blog, have left you lots of hugs. Oops I was so excited nearly forgot to say your card is stunning and very elegant as always. Beautiful card! Thank you for joining us at Quirky Crafts. That is a cool medallion image and so pretty with the colors you used. Lovely card, so pretty! Thank you so much for joining Quirky Craft's Challenge this time round, the voting should start late tomorrow (Friday) and Saturday so be sure to pop back and vote for your favourites, and get your blogging buddies to vote for you! Although, saying all that, inlinkz started the voting early and now has corrected that mistake, but doesn't show when the voting starts, but with any luck that will be corrected as soon as possible!! 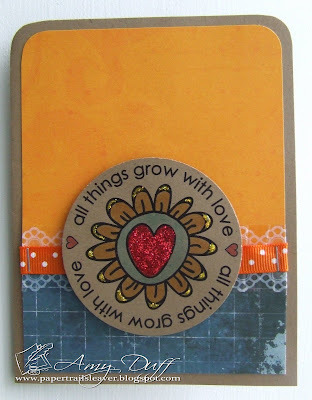 Great card and thank you for playing at the Aud Sentiments birthday blog hop. Beautiful card! Love the white space and how you highlighted the sentiment. ... and I meant to say Happy Easter! We would love for you to join Aud Sentiments DT. I couldn't find your email address on your blog so I hope you get this soon. What a beautiful card - really lovely! Thanks for joining in with Aud Sentiments' celebrations!